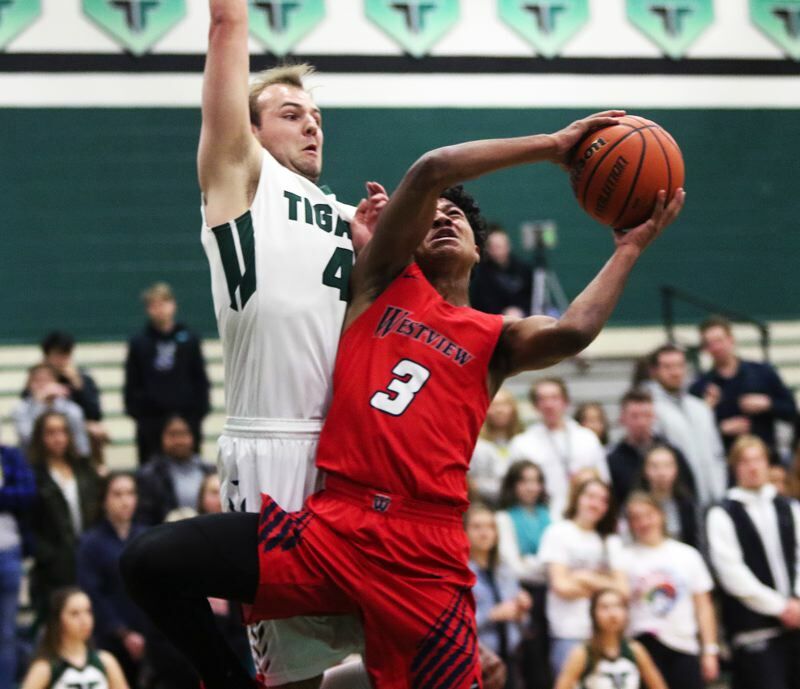 TIGARD — In their previous game, the Tigers felt like they might have let a win slip away. 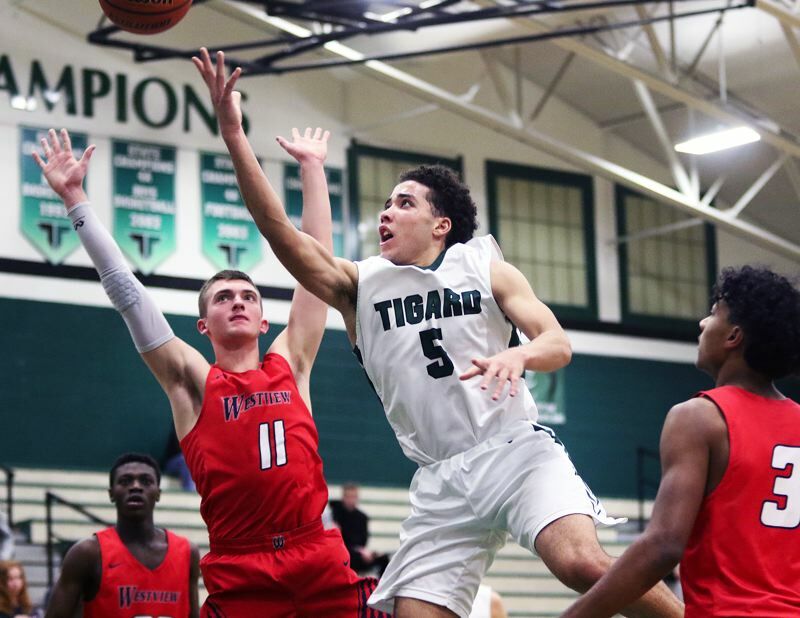 Well, on Friday, the Tigard High School boys basketball team made absolutely, positively sure that they were going to keep a firm grip on a victory. 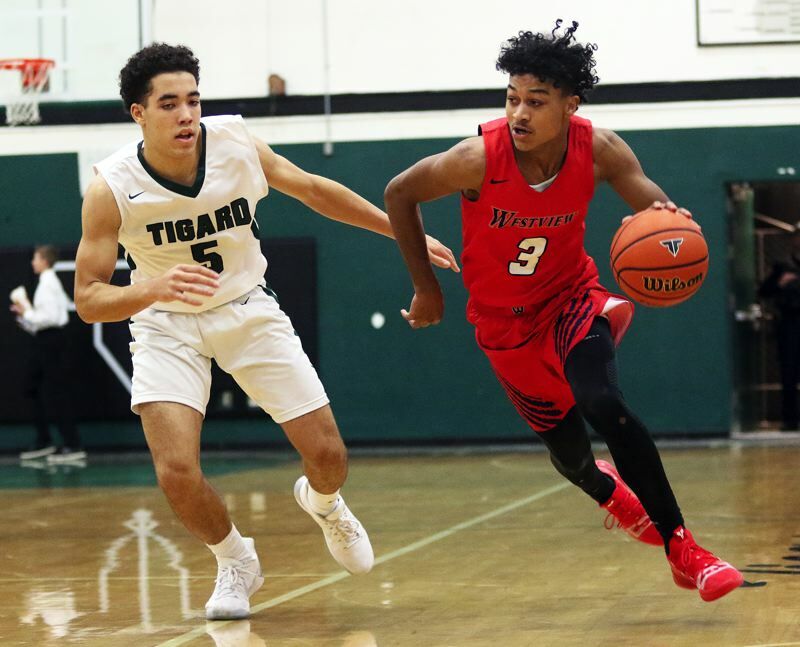 The Tigers, with efficient runs on offense, and with stifling defense, powered their way to a 58-34 win over Westview in a non-league game played at Tigard High School. 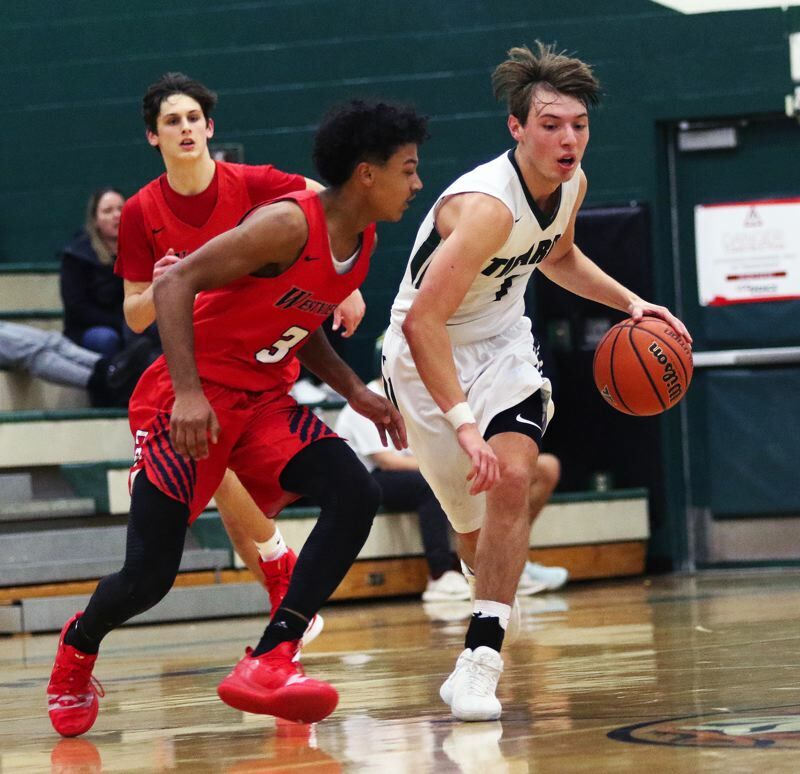 "All week we practiced really hard on defense," said Tigard sophomore Drew Carter, who scored 18 points in the victory. "We focused on defense, because last week we gave up 70 points (in a 70-68 loss to Clackamas on Dec. 1), so we buckled down on defense." 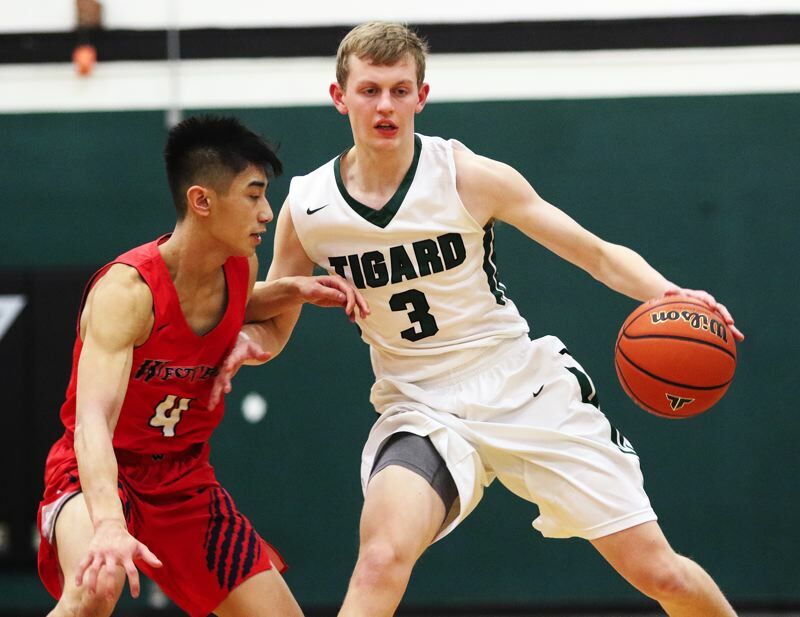 "We played with a chip on our shoulder tonight," Tigard senior guard Jake Bullard said. "Our defense was really good. We worked hard on defense all week in practice." With the loss, Westview moved to 1-2 on the season. The Tigers improved to 2-1 on the season with the victory. "This was really good," Bullard said. "We worked hard for this one." And that hard work started right away. The Wildcats, getting back-to-back baskets from junior London Smalley and a free throw by senior Noah Bautista, took a 5-4 lead with 5 minutes and 15 seconds left to play in the first quarter. 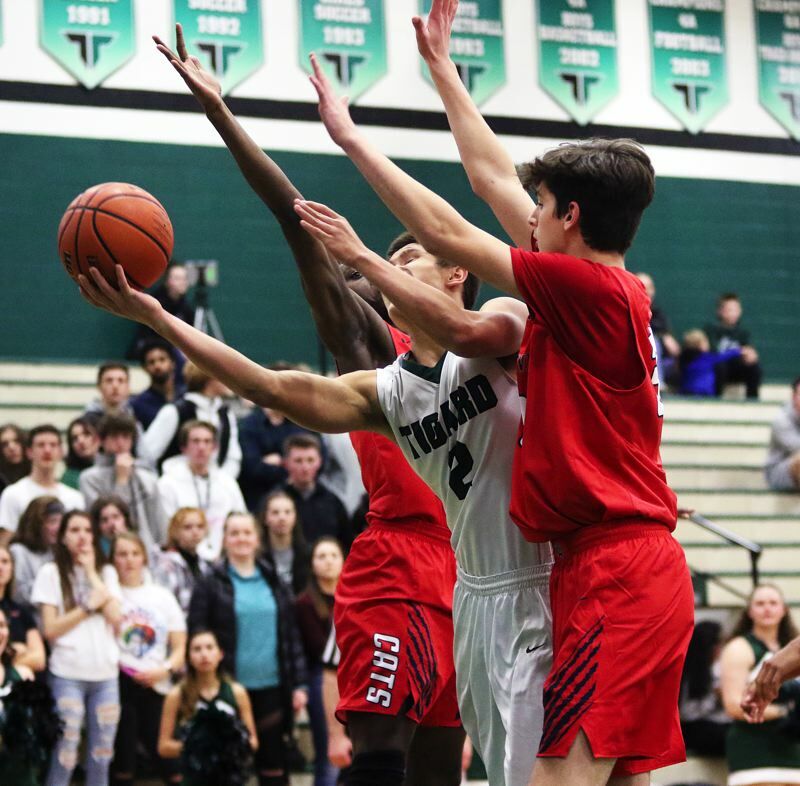 Tigard answered with consecutive 3-point baskets by seniors Stevie Schlabach and Diego Lopez to take a 10-5 lead with 3:44 remaining in the quarter, and the Tigers didn't trail the rest of the way. 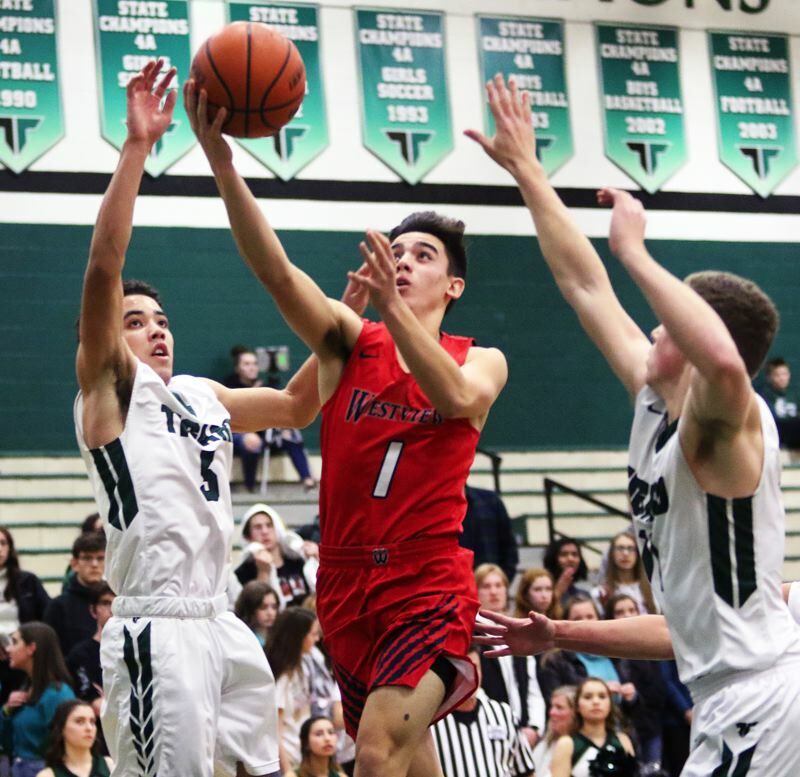 Tigard added a short-range jumper by Lopez, a 3-pointer by senior Luke Ness, coming off an assist by junior Max Lenzy and a buzzer-beating follow-up basket by senior Eric Sawin to claim a 17-10 lead at the end of the period. Westview tried to battle back early in the second quarter. The Wildcats, getting a 3-pointer by freshman Keshav Anand and a sort-range banker by senior Juwon Esuk, trimmed the margin to 22-19 with 4:21 left to play in the second quarter. But Tigard — and Carter — responded in a big way. Who had struggled early on from the field, and was scoreless to that point, ended the Westview run with a 3-pointer from the left corner. He then scored on an alley-oop layup off a pass from Schlabach and then sank two more 3-pointers, giving him 11 unanswered points in a span of 3:27, while also giving the Tigers a 33-19 halftime advantage. "You have to shoot through it," Carter said with a smile. "I shot through it and trusted my shot." The Tigers then seemed to up their defensive intensity in the third quarter. 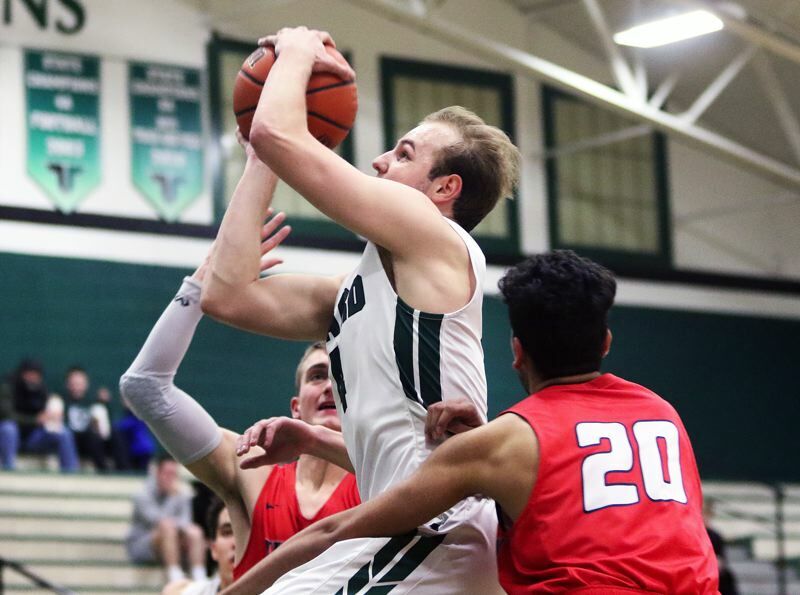 Tigard allowed Westview to score just four points, coming on 1-for-8 shooting from the field, while also helping to force the Wildcats into seven turnovers in the quarter. Meanwhile, Schlabach scored six points in the period, and Bullard sank a 3-pointer, giving the Tigers a 47-23 lead going into the fourth quarter. Tigard kept rolling early in the final stanza. Schlabach scored four straight points to open the period. Carter then converted a 3-point play, giving the Tigers their biggest lead of the game, at 54-23, with 5:57 left to play in the contest. 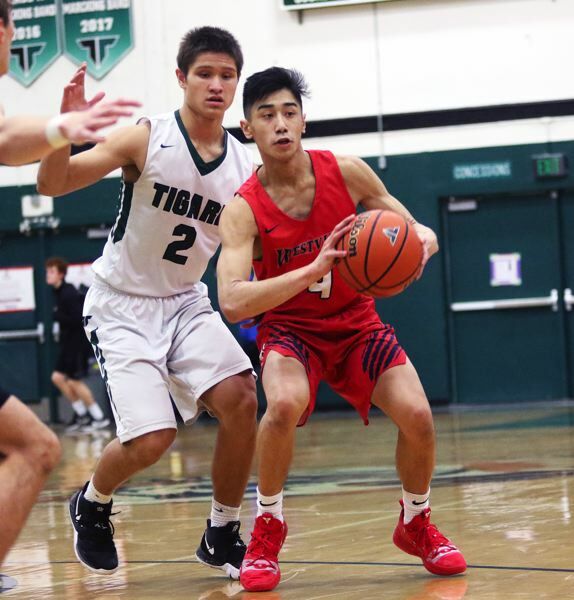 Westview did get a pair of 3-pointers from junior Anshul Batish in the final 5:04, but that wasn't nearly enough, as Tigard closed out the 58-34 victory. "No, definitely there was no let up tonight," Carter said. "We knew what we wanted to do. We worked harder and focused. Tonight was a step in the right direction." "On offense, we worked it around and got some good shots," Bullard said. "This was a lot of fun." Schlabach led all scorers in the contest with 20 points. He also had 11 rebounds and a pair of steals. Carter had seven rebounds and three assists to go with his 18 points. Lopez had seven points and six rebounds. 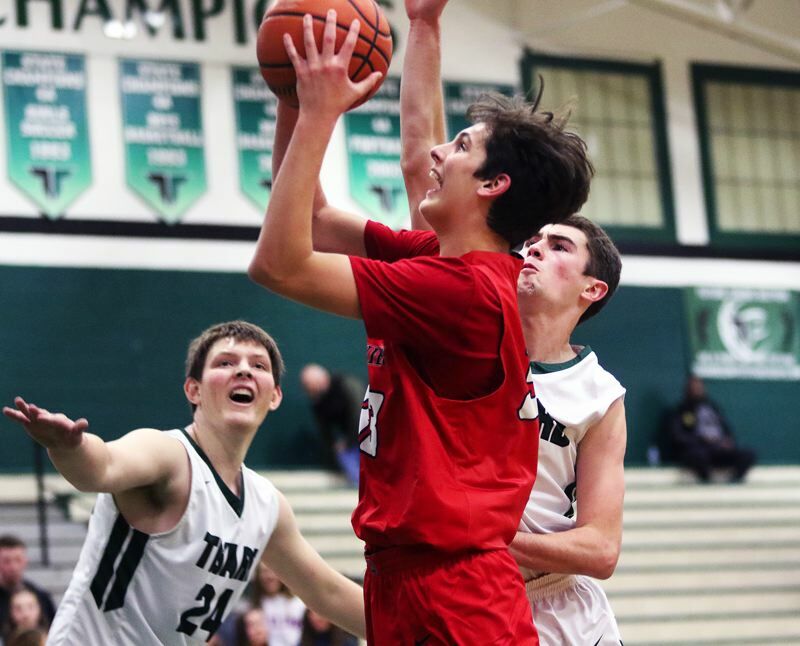 Tigard, as a team, made 21 of 54 shots from the field, with eight 3-pointers, and eight of 12 free-throw attempts. The Tigers also outrebounded Westview by a 34-26 margin. "The ceiling is high," Carter said of the Tigers' potential for the season. "We have a lot of confidence and we have to keep working. We're going to take it week by week, and play as hard as we can." Smalley had six points, five rebounds and two steals for Westview. Batish also scored six points for the Wildcats. Esuk had five points and four rebounds. Westview, as a team, made 11 of 39 shots from the field, with five 3-pointers, and seven of 13 free-throw attempts. 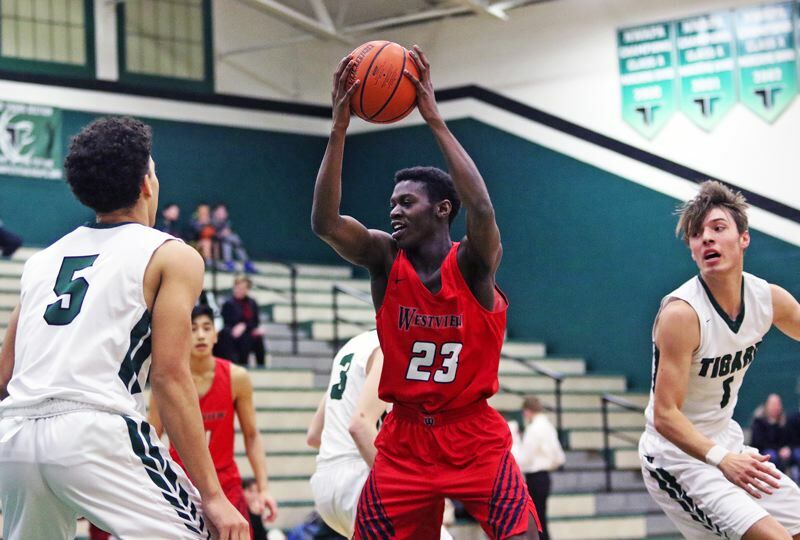 Westview will be back in action on Tuesday, when it hosts David Douglas in a non-league game starting at 7:15 p.m. Tigard will next play on Friday, when it hosts South Salem in a 7 p.m. non-league contest.